Ride Like Hell and You’ll Get There chronicles,in the main, Paul’s efforts to race in Speed Week on a motorcycle (of sorts) engineered to run on bio-diesel fuel and go very fast on a salt lake in the middle of nowhere. Plagued by cancellations, logistical obstacles, lost keys and broken limbs, it takes three years before Paul finally gets a break. Paul also writes of a motorcycle touring trip with a friend around Tasmania, a wild conference in the US and his temporary gig as a documentary presenter, marriage, fatherhood and business. Carter’s books could be accused of being juvenile and crude, and there is some truth to that. Reading Ride Like Hell and You’ll Get There is often like eavesdropping on a ‘boy’s’ only pub night, complete with poo jokes, copious amounts of alcohol, bad language and displays of machismo. Not everyone will appreciate Paul’s sense of humour but I found myself smiling widely often, even while occasionally shaking my head with a mixture of disbelief and wry contempt. Yet Ride Like Hell and You’ll Get There is not all a ‘boys own adventure’, Paul also relates several serious moments though often tempered by the surreal, including suffering the side effects of food poisoning while his wife is in the throes of a miscarriage, a court case that drags on and on and on, and a ruined $1000 helmet thanks to a territorial dog and a potty training two year old. I’m not that interested in motor racing or the specifics of alternate fuel (though I believe we should be investing in it) but I still enjoyed Ride Like Hell and You’ll Get There. 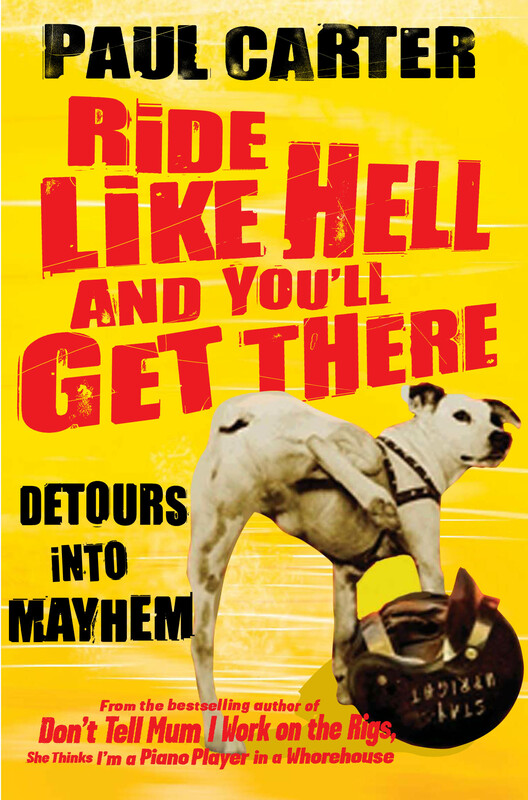 It’s a quick read, mostly light and amusing and is as advertised -a detour into mayhem. I imagine this book will particularly find an audience amongst fans of the television show ‘Top Gear’ and its ilk and, with Christmas coming up, it would make a great stocking stuffer for your father/husband/brother etc.